For tourists visiting South Central Mindanao and who are into bird watching, including Tacurong City in their itinerary should not be overlooked. The smallest in the 12 municipalities of Sultan Kudarat, in terms of land area, this city has 20 barangays and considered as the commercial, educational and agro-industrial center of the province. The city was once a part of the Buluan municipality in Cotobato and was then known as “Pamansang”. It was later changed to “Talakudong”, a Maguindanao term for the head covering worn by the early people and settlers. Later, the name was changed to “Tacurong”. A visit to the city awaits the traveler a day of fun, adventure and education. Get to know more about this stunning backpacking destination in the Philippines. Every year, locals celebrate the Talukadong Festival . Observed on the 18th day of September, this colorful celebration depicts a lot about the history and culture of the city. Dance rituals include three dances, Singkil, Binanog and Sayaw sa Bangko from the Moros, Ilonggos and Ilocanos, respectively. Another significant event that goes on for a month is known as the Inugyunay Festival or the “Festival of Unity”, from the 2nd week of December to the 2nd week of January. 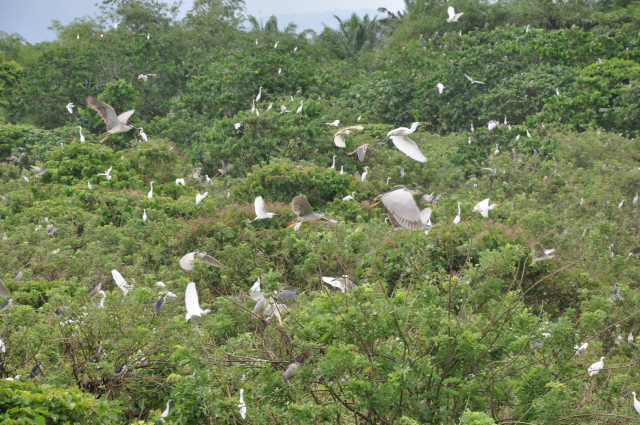 Another activity to get into is bird-watching in Baras Bird Sanctuary. Spend the afternoon in awe of the migratory birds, egrets who have grown to 20,000 in number from only four reported in the 1990s. Considered as an Ecological Tourism destination, the sanctuary is sprawled over an area of about one to two hectares and located along Kapingkong River. The birds species to watch out for include the Black Crowned Night Heron and the Egret. After an afternoon in watching the thousands of birds in the sanctuary, another sight to see is Lake Buluan, the third largest lake in Mindanao. For a taste of a popular Muslim delicacy in the area, buy the famous Maguindanao Pastil for only P10. And for travelers who crave for ice cream and other food treats, make a stop over at a local restaurant, Goldyfoods Foodline, known for their home-made ice cream which include Durian flavor. There are other food establishments offering different specialties to satisfy any traveler’s hunger. A visit to the nursery of oil palm trees and the plant is also an activity to consider since the city is a major producer of the African palm oil which is important in most chemical industries such as plastic and soap-making. Visitors to the city can choose from a plethora of lodges and inns that will suit their budget and preference. There is also an interesting destination for both local and tourists located at a fruit farm in Barangay New Passi, the Monte Vicenteau Resort. Amenities include an adult pool, a kiddie pool, mini waterfall and cottages for the guests. Tacurong, Sultan Kudarat is accessible via air, water and land. From Manila, tourists can either take the plane to General Santos, Davao or Cotobato City. To go there on a ship, travelers can book from Manila to Iloilo and then General Santos or from Manila to Cagayan de Oro. Visitors can then go to Tacurong City on a bus coming from any of these three points – General Santos, Davao or Cagayan De Oro City.